Holiday parties are in full swing. If you are an invitee to an upcoming party or are doing the entertaining yourself, we’re sure one of your biggest priorities is selecting delicious and heartwarming dishes. While the main focus is usually the main course, don’t forget to wow before your guests have taken their seats. 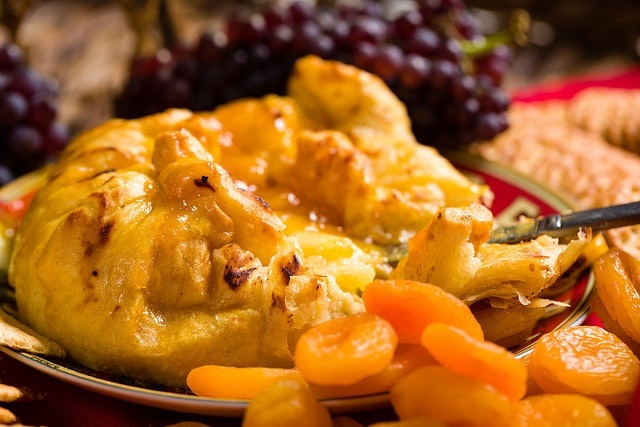 Baked brie is a traditional appetizer around the holidays, but beyond it’s flakey & creamy taste it is a breeze to prepare — even more incentive to include it on your holiday shopping list! If done with a little bit of detail, it also makes for a beautiful presentation on your table. To see just how easy it is to prepare, scroll down to view our recipe. We hope your holiday parties go off without a hitch and include savory and scrumptious food to bring warmth and cheer to your home as well as to you and your guests. Happy Entertaining and Happy Holidays!